There is No I in Team looks at how to be a selfless leader who puts his team ahead of himself. Life should not be estimated exclusively by the standard of dollars and cents. I am not disposed to complain that I have planted and others have gathered the fruits. A man has cause for regret only when he sows and no one reaps (Charles Goodyear). When you stop giving and offering something to the rest of the world, it's time to turn out the lights (George Burns). W.H. Auden said, "We're here on earth to do good for others. What the others are here for, I don't know." 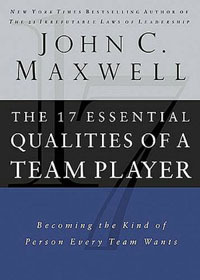 John Maxwell writes, "No team succeeds unless its players put others on the team ahead of themselves. Being selfless isn't easy, but it is necessary." Team leaders and team members can cultivate an attitude of selfless by keeping the following insights in mind. John Maxwell explains, "The heart of selflessness is generosity. It not only helps to unite the team, but it also helps to advance the team. If team members are willing to give of themselves generously to the team, then it is being set up to succeed." Maxwell writes, "If you show loyalty to the people on your team, they will return loyalty in kind. Loyalty fosters unity, and unity breeds team success." When you put your team members ahead of yourself, they usually will work hard for you and help you finish the task at hand even if the task is a very difficult one. Maxwell writes, "We value independence highly because it is often accompanied by innovation, hard work and a willingness to stand for what's right. But independence taken too far is a characteristic of selfishness, especially if it begins to harm or hinder others." Seneca explains, "No man can live happily who regards himself alone, who turns everything to his own advantage. You must live for others if you wish to live for yourself." To become more selfless, you will need to promote someone other than yourself. We usually find it rather easy to talk up ourselves and promote our achievements. However, take opportunities to praise others instead of yourself. To become more selfless, you will need to take a subordinate role. Instead of taking the best place, practice serving others and letting them go first. To become more selfless, you will need to give secretly. As John Bunyan said, "You have not lived today successfully unless you have done something for someone who can never repay." If people don't know you give, they cannot repay you. Create a habit of giving secretly! For more information about this subject, click on There is No I in Team.